Rains normally come during the summer (April to September) and the time from October to April is called dry season with very few and light rain. Annual rainfall is ranges from 2000 to 2500mm depending on location. Ninh, Sapa town and Fansipan peak in Laocai, Phong Nha Grotto in Quang Binh, Bach Ma mountain in Hue, Hai Van pass in Danang and Dalat in Central Highland. This land is also home of some of the most colorful hill-tribes in the region. The Red River delta and the Mekong River delta with very fertile soil is home of wet rice agriculture. The 3,260km long coast line offers the best choices among some of the best beaches and lagoons in the World. 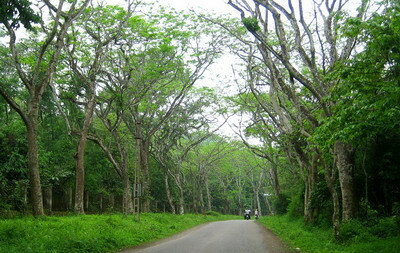 The forests account for most of the total land area. Some of the more famous national parks located throughout the country include Ba Vi in Ha Tay, Cat Ba in Haiphong, Cuc Phuong in Ninh Binh, Bach Ma in Hue, and Cat Tien in Dong Nai…. Vietnam is located on the eastern most of the Indochinese peninsula and with the total area of 331,688 square kilometers, a bit larger than Italy and almost the size of Germany. It borders the China in the North, Laos and Cambodia in the West, Gulf of Tonkin and East Sea in the East whiles the Gulf of Thailand in the Southeast. Vietnam’s S-shaped with the length of 1,650 kilometers, widens in the North and in the South while rather narrow in the Centre. Three forth of the country’s land area is hilly and mountainous regions. The highest mountain in Vietnam is Fansipan with the height of 3,143 m. The Red River delta in the North with an area of around 15,000 km2 and the Mekong River delta in the South of around 40,000 km2 are two baskets of rice that feed the population and produce exported food stuffs. These two deltas are also the main habitats and most populated area in the country. Vietnam is endowed with a huge diversity of natural conditions and beautiful landscapes. The notable Karst system dominates large part of the North forming great scenery with sinking holes, caves and stunning rock formations like Halong bay, Tamcoc or great lime stone plateau of Dongvan… while the Central Highland is dominated by equal hills of red volcanic soil with industrial plantations stretching as far as one can see. The Country is home of tropical rain forests that cover from the middle land up to top of mountains. The long coast of more than 3000km dotted with beautiful beaches and lagoons offers great water adventures and swimming. Vietnam is located in both a tropical and a temperate zone and has a tropical monsoon type of climate. In general, from May to September the southern monsoon sets in and from October to April, the northern monsoon is dominant with wind from the North and Northeast. There is a transition period between each monsoon season when winds are light and variable. Under influence of monsoon, and further because of the complicated topography, the climate in Vietnam always changes in one year, between the years, or between the areas from North to South and from low to high. The North of Vietnam with the weather is divided into four seasons and rather typical type of subtropical weather. During the winter, from November until February, the day time temperature is pleasantly cool and the weather is often damp. To the far north in places like Sapa, there is occasionally freezing temperatures during this time. It begins to warm up in March and stays dry and warm until May. From June to October, the weather is rather warm and rainy. Central Vietnam experiences warm weather from July to October and wet, colder weather from November to May. Frequent typhoons hit the central coast from August to October which can cause flooding and disrupt travel plans. Although the temperature remains fairly steady throughout the year, Southern Vietnam has two seasons. The dry season lasts from December to May, while from May to November is the rainy season. In general, there is no good or bad season for visiting Vietnam. What ever the season and period of the year, there are always somewhere or the whole country with weather is pleasant and favorable. On a trip you can sometime experience different types of weather and climate as you cruise along its length.